I've added a new section under 'CELS'. It's still in BETA though. I've been keeping track of some Saint Seiya cels that have been on sale and I made a small database for it. The cels in the database can be searched by tag or by episode number. The database is still rather small at the moment ... a little over 100 cels are currently in it but it will grow steadily. Also, I warn about some sellers on some cels ... these sellers buy cels cheap and then sell them for upto 10 times the previous price. This is mainly created for my personal records but you are free to use the information in the database and you can also update me on info if the cell is still uncategorized. I have added a new section under Stuff. It is still very basic and I will prolly change how it will be presented but you will find my music collection there. I have added Saint Seiya Ongakushuu 7 (vinyl) for now. Pretty hard to come by these days... this one does not show up often. Wow, almost 12 years without an update on this site. I have been updating my rubberslug gallery recently but honestly not all that much. In all those years I have been selling some of my cels thinking I lost interest. However, recently I have rediscovered this hobby and been collecting a few cels here and there. I am no longer focussing on Saint Seiya cels only. The prices for Saint Seiya cels are crazy atm so I am pretty happy that I still have a few of those small treasures in my collection. 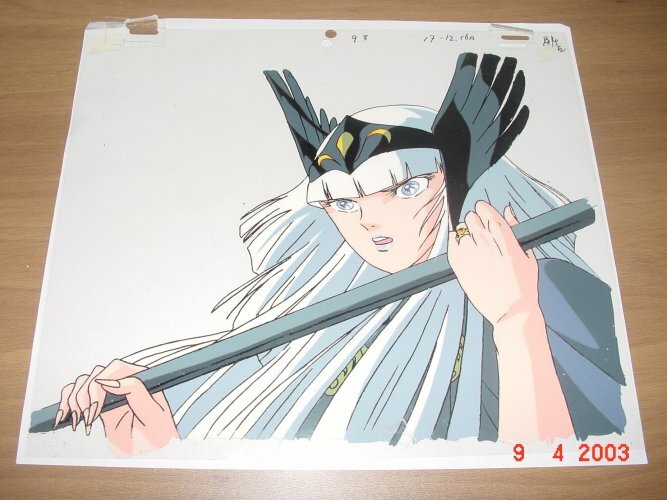 I have been looking out for nice cels in general. It does not matter if the show is popular or not, it does not matter if I actually saw the show either. I hope to update the site more often now that I have actually found my login details once again ^_^. Some new cels on the site ... not a full update but a I got some nice new Polaris Hilda cels and a very nice new Shaina cel. This is not a full update because I still have some other stuff I need to put online (a complete set of sketches from Polaris Hilda and another nice cel of her). I already took the digital pictures ... I only need to resize them a bit but I'm too lazy at the moment. Wow, it's been a while since I updated this page. 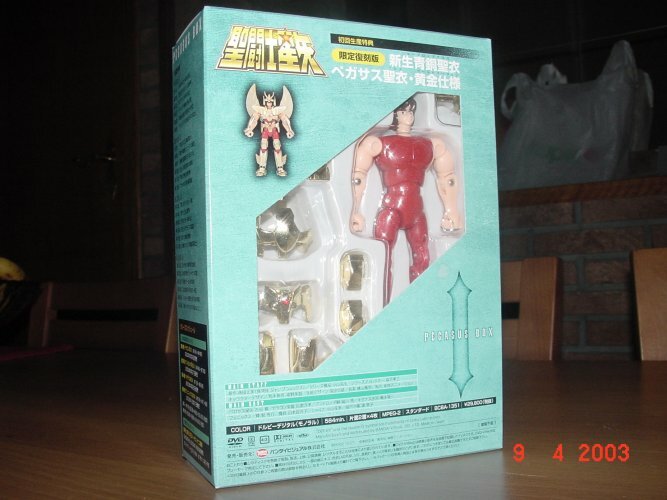 Got some pictures of 1 new cel (a cool Ilda of Polais cel) and the 2 action figures that come with the first 2 DVD-boxes (Seiya and Shiryu action figures). Also I got the first Hades DVD from Japan ... this one comes with a nice keychain of the Pegasus cloth !!! I'm still waiting on the other HADES DVD's to arrive. I saw OVA 3 and 4. The quality was horrible but it was still worth it. There is news for all you DVD-collectors out there. The 2nd DVD-box (containing episodes 25 through 48) is available on pre-order on CDJAPAN. The first HADES DVD is also available on pre-order there. Yippie I finally saw the first Hades OVA ! It rocked altough I had the most crappy version out there. Some guy actualy put his handcam in front of his TV and recorded the episode. Sometimes I could see the reflection in his TV and saw him sitting in front of the TV and his handycam on the table. Evenso the episode was nice and with some cool CG-FX in it ! Saint Seiya going 3D !!! Anyhow ... a must see ! The new design on the main-page is finished ... I hope you all like it ! The underlying pages still have the old design and I'm in the process off changing them all but this can take a little longer because I'm working on several projects at the same time. Please post your comments on the BOARD ! 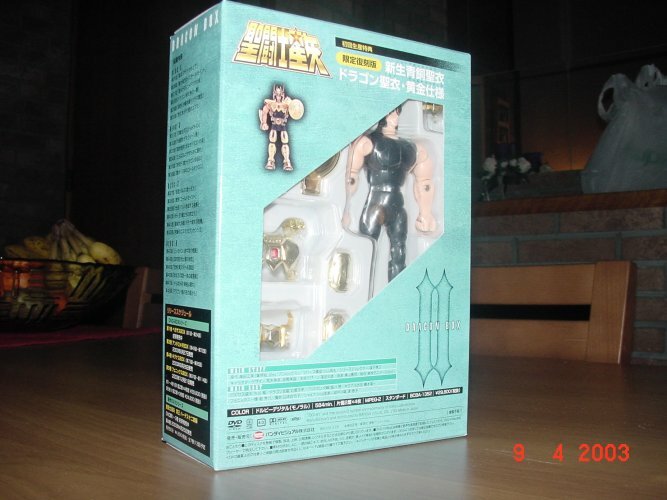 Today, I got my first Saint Seiya Calendar ever. The images on the 2003 calendar are awesome and are all illustrated by Shingo Araki ! I took some pictures from it and put them into the Stuff section. Check it out !!! There's a small HADES trailer on the official Saint Seiya site : http://www.toei-anim.co.jp/ova/seiya/. The quality of the anime look awesome ! Today is my birthday and this is realy a great present ! DVD release is 25 January 2003 !!! OMG THIS IS AWESOME !! !